SonotaCo.JP :: トピックを表示 - hi ! 日時: Tue Apr 12, 2016 4:49 pm 記事の件名: hi ! Rarely I can keep the values ? 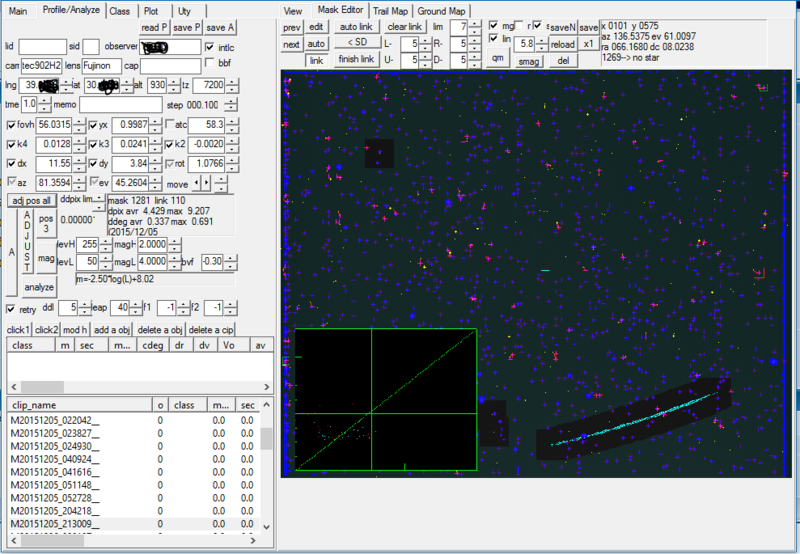 ?within the limits described by the Page 6 of the Guide of Ufo Analyzer...and I have high value both dPix avr and dpix max value on UfoAnalyzer. Do you know suggest a remedy to get correct results? 日時: Tue Apr 12, 2016 8:11 pm 記事の件名: Re: hi ! Well, I would like to explain what is happening on your case, and how to know the problem, and how to do. First of all, your screen shot is showing tataly wrong mask-star links. This can be known from the magnitude graph(left bottom on the image). Below is a correct sample. The arrowd line is the theoritical line and dot plot should be near or on the line. But your plot shows randon position and not near the line. So your links may be totaly incorrect. I recommend to tune all parameters again. 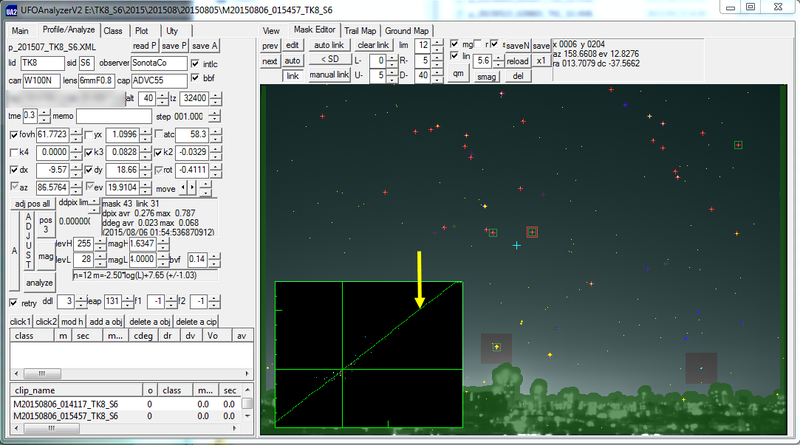 It will become much easier if there is a famous constellation imaged in FOV. Your SMlevel setting on UFOCapture is too low.. That cause too many masks (blue dot). Set MaskW on and tune SMlevel to decrease the masks and appropreately masks the real bright stars only. I believe that you can solve this. but If you cannot, send me some sets of clip files except avi that contains many real star images , and system infomation.